Greatest Thinker Showdown! FINAL MATCH! Welcome to the Greatest Thinker Showdown! You have chosen the World's Greatest Thinkers from across time and space to battle it out with one another in a tournament masterfully designed to give hugodrax a headache. Re: Greatest Thinker Showdown! FINAL MATCH! Lol. Damn fine work, boys. Don't look at me! I voted for Goose. I'm still ticked about Howard Hughes. His Mormon body guards did all his intellectual heavy lifting. 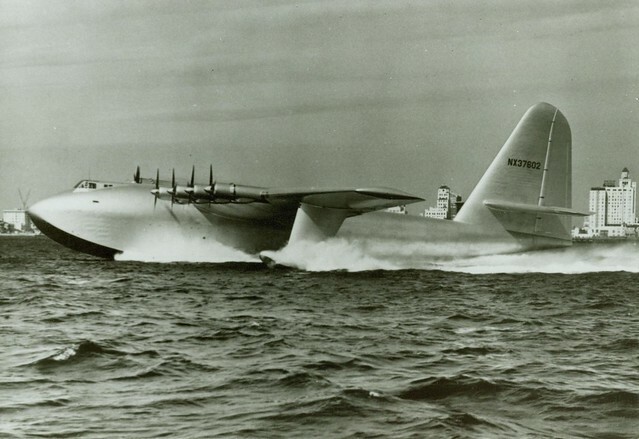 Howie could barely get the Spruce Goose "on step"
Aristotle-- a man known for his great thinking breadth. He had something to say about everything. Unfortunately he is known for being mostly wrong on his topics. Every subject seems to go back to him and then indicate "he was wrong but he was first". Leonardo -- a man known as the epitome as "The Renaissance man". That means he was knowledgeable across all the known disciplines and a major contributor to them. Inventor, painter, architect, scientist, etc. he had involvement in them all and showed mastery-- later folks would turn his design into function: parachutes, tanks, gliders, etc. Given aluminum and JP-4, Leonardo probably could have designed the B-52. Wait.... What was Aristotle wrong about? Was he actually "wrong" about anything, or is that just a slander that the Enlightenment hurled against him for deriving so many Christian truths by using Reason alone? Just had a chat with Pipeson. Aristotle used the scientific method as we know it to reach valid conclusions within his grasp. We don't dismiss the great work of thermodynamicists in the 19th century just because they were not aware of relativistic physics discovered in the 20th century. Spontaneous Generation: The Enlightenment had a notion of spontaneous generation that has been proved false. But Aristotle's version is more philosophical, and remains a topic of discussion. Aristotle dissected eels and transplanted.... he failed to find sexual organs in the eels and the clams refused to reproduce in the new environment. Like a good scientist, he reported that he was unable to disprove the theory of spontaneous generation. Geocentric v. Heliocentric: As conveniently as the heliocentric theory explained the motion of planets, the inability to observe parallax in the stars failed to disprove the geocentric theory. It remained a topic of valid dispute until Copernicus and Galileo. Nature abhors a vacuum: What Aristotle knew was that nature cannot tolerate a VOID.... a place of no-space. Modern physicists agree -- 'empty space' is constantly twinkling with virtual particles that wink in and out of existence. It was really another blunder of the Enlightenment, confusing a volume of low pressure with Aristotle's Void. Pipeson notes that Leonardo "wrote his own press releases." He is a modern man who has always been with us. There were a plethora of Leonardoes in the Age of Rome who were lost -- we remember the name of Archimedes, but few of his inventions. We still cannot recreate the enduring wonder of Roman concrete. One wonders if Leonardo da Vinci could have endured a Dark Age. Aristotle was lost. Yet he survived through the Dark Age within the Moslem culture, and was re-discovered as a bright light of ancient wisdom. Aristotle -- He returned from the grave after a millennium and still shined again as brightly as he did in Athens. 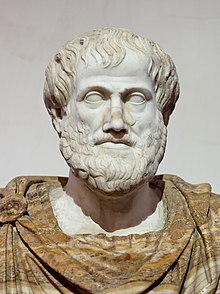 ARISTOTLE: Aristotle held that the universe was divided into two parts, the terrestrial region and the celestial region. In the realm of Earth, all bodies were made out of combinations of four substances, earth, fire, air, and water,* whereas in the region of the universe beyond the Moon the heavenly bodies such as the Sun, the stars, and the planets were made of a fifth substance, called quintessence. *Here the elements are denoted by italics. Thus, earth is a pure element, whereas Earth is a planet made mostly of earth but also containing some of the other elements; air is a pure element, whereas the air we breathe is mostly air, but with some other elements mixed in. Heavy material bodies like rocks and iron consisted mostly of earth with small parts of the other elements. Less dense objects were thought to contain a larger admixture of the other elements along with earth. For instance, humans consisted of a complex mixture of all the elements: earth, which gave material strength and weight; fire, which provided warmth; water, which accounted for blood and other bodily fluids; and air, which filled the lungs and provided the breath of life. Of course, some people were more earthly, fiery, airy, or watery than others. The Sun, planets, and stars were made of quintessence, a pure, perfect substance, quite unlike the elements found on Earth. The Moon, marking the boundary between the sublunary earthly region and the supralunary heavenly region, was mostly quintessence, but because of its proximity to Earth it was contaminated with a small admixture of earthly elements, which accounted for the visible imperfections on its surface. The fundamental assumption in Aristotelian physics was that the natural state of sublunary matter is rest. Earth, air, and water must seek their natural place at rest in the center of Earth unless stopped by an impenetrable surface like the ground or a table. The natural place of rest of the element fire is somewhere above us (but well below the Moon). The air we see around us is a mixture of the elements air and fire (after all, air, at least in Greece, has warmth), so its behavior is complicated by the competition between the tendency for fire to rise and air to fall. Except in very complicated situations such as when air and fire were mixed together, motion was not a natural state of affairs. The Four Elements theory served doctors, scientists and engineers for more than a millennium before the theory was refined and surpassed by John Dalton in the early 1800's. Aristotle didn't invent it; he just advanced the science within that theory. Aristotle's theory that all things seek a state of "rest" is essentially the Second Law of Thermodynamics -- All systems seek a lower energy state (which results in increasing entropy). Not sure why the question of The Philosopher's and Da Vinci's respective participations in truth have to be framed as a zero-sum game. Oh, yeah. That's right. Cuz we're "deciding" the World's Greatest!